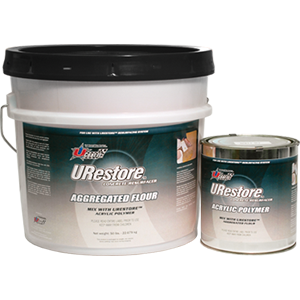 URestore allows the do-it-yourself’er to resurface a rough or uneven concrete surface prior to application of the UCoat It floor coating system. 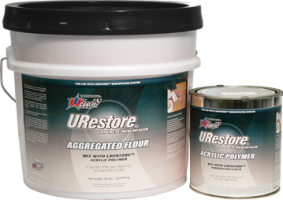 URestore is a aggregated flour-like mix that is blended with an acrylic polymer binder. The mixed material is poured out over the surface and squeegeed or hand-troweled smooth. Once dry, URestore can be coated with a UCoat It floor coating system. For proper application, URestore™ Bonding Agent water-proofing primer should be applied prior to the application of URestore. Typical Coverage up to 100-200 sq.ft. depending on overall thickness of application. Includes 50 lbs. of URestore aggregated flour, 1 gallon of URestore acrylic polymer, 1 gallon of URestore Bonding Agent, and application instructions. Typical Coverage up to 100-200 sq.ft. depending on overall thickness of application. Includes 50 lbs. of URestore aggregated flour, 1 gallon of URestore acrylic polymer only. URestore bonding agent sold separately. Typical Coverage up to 50-100 sq.ft. depending on overall thickness of application. Includes 25 lbs. of URestore aggregated flour, 1/2 gallon of URestore acrylic polymer only. URestore bonding agent sold separately.